The Oxford African American Studies Center combines the authority of carefully edited reference works with sophisticated technology to create the most comprehensive collection of scholarship available online to focus on the lives and events which have shaped African American and African history and culture. It provides students, scholars and librarians with more than 10,000 articles by top scholars in the field. I grew up with Star Trek. When I was 10, I helped my mom put together an intricate scale model of the USS Enterprise (NCC-1701, if you’re curious). I knew that LeVar Burton could tell me about a warp core before I knew that he would read me a children’s book, and I knew that Klingon was a learnable language long before I had ever heard of human languages like Tagalog or Swahili. So, imagine my surprise when, in the course of discussing the new film Star Trek Into Darkness with some astute colleagues, I found out that the original Star Trek television series had not one, but two, fascinating connections to my work as assistant editor of the African American Studies Center. 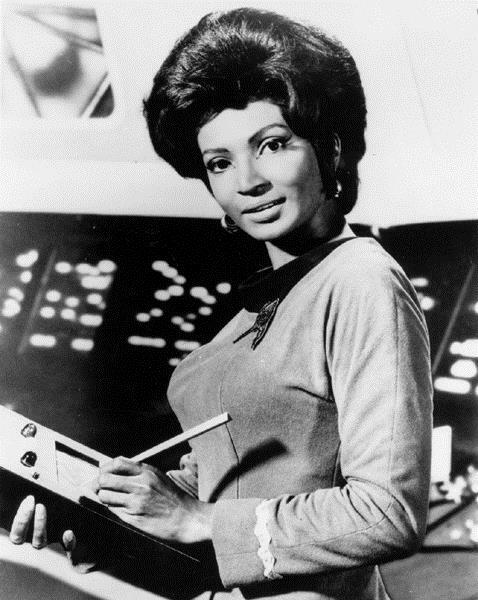 Both stories involve the actress Nichelle Nichols, whose trailblazing work as Lieutenant Uhura, the USS Enterprise’s chief communications officer, in the original Star Trek series has been widely lauded as an important step forward for both women and African Americans in the media. Real-life astronaut Mae Jemison, who guest-starred as a transporter operator in an episode of the later Star Trek: The Next Generation series, has directly acknowledged the influence of Lt. Uhura’s character on her choice of career, and Nichols even had a role in bringing minority and female astronauts to NASA in the 1980s. The first anecdote dates to 22 November 1968, when American television audiences were treated to a particularly far-fetched episode of Star Trek entitled “Plato’s Stepchildren.” Now, the details of the show’s plot sound fairly ridiculous, even to a Trekker like me, and I will spare you their description here for fear that you won’t be able to take the rest of this post seriously. Toward the end of the episode, though, something historic occurs: Captain Kirk (played by William Shatner) and Lt. Uhura engage in a surprisingly passionate kiss. The two are not romantically linked otherwise, and the kiss is the result of alien mind control tactics, but these details are of little concern. For many people, this moment represents the instance of the first interracial kiss on television. NBC executives were concerned about how advertisers, affiliates, and audiences might react to the kiss, and they insisted that the scene be reshot without it. Shatner deliberately crossed his eyes for every new take, however, and the show’s producers decided to move forward with the scene as it had originally been shot. Audience reaction to the episode, as measured by letters sent to NBC, was nearly universally positive. Some have argued that this was not in fact American television’s first interracial kiss, but the debate is largely semantic. Star Trek’s kiss was without a doubt a very early example of passionate interracial physical contact on television, and the show’s progressive agenda clearly anticipated a shift in cultural mores so complete that we wouldn’t bat an eye at a similar scene today. This famous kiss might never have occurred, however, if it hadn’t been for a second incredible story that involves the intercession of Dr. Martin Luther King Jr. himself. In 1967, as the first season of Star Trek was coming to a close, Nichols was ready to leave the show in order to focus on a Broadway career. After handing her letter of resignation to series creator Gene Roddenberry on a Friday afternoon, Nichols attended a fundraiser in Beverly Hills where she met Dr. King, who introduced himself as Nichols’s “greatest fan” and described in detail how his entire family made time to watch the show every week. When Nichols began to explain that she was in fact leaving the show, Dr. King stopped her mid-sentence to insist that she stay. He praised the show for its inclusive vision of the future of humanity, and underlined the significance of the fact that she played a smart African American officer with a vital role in the command structure of the USS Enterprise. If Nichols were to leave, she would simply be giving up on the incredible progress she had made. Nichols agonized over Dr. King’s words all weekend, but resolved to return to Roddenberry’s office on Monday to take back her resignation letter. Roddenberry had already torn it up. While these anecdotes might pass as mere trivia for some, I think that they serve as a stark reminder of just how different American popular culture looked only a few decades ago. It’s worth stating that, while Dr. King saw the promise inherent in Lt. Uhura’s character, he didn’t live to see the kiss that indicated that social barriers to equality were continuing to fall. Was the original Star Trek ahead of its time? Cancelled after three seasons, the series was never a ratings success and certainly didn’t resonate with a wide range of television viewers when it originally aired. The fact that the show spawned a successful media franchise that has only grown more expansive in recent years suggests, however, that the show’s progressive vision contained a fundamental wisdom capable of inspiring sci-fi fans and the general public alike. Nichelle Nichols and Martin Luther King Jr. understood the power of this vision 45 years ago, and the continued presence of Star Trek in our lives today seems to be evidence that Gene Roddenberry’s hopes for humanity were not misplaced. Tim Allen is an Assistant Editor for the Oxford African American Studies Center. You can follow him on twitter @timDallen. What impresses me more is how Lt. Uhura was often called to the navigation or the weapons post when the “temp” bridge officers (always named “Anderson”) become possessed by some crazy alien and can no longer perform their duties. Talk about skills! actually i just finished the star trek the movie. i do that just now because some relative tell me that movie is very good and the sekuel (into the darkness) is a must watch movie.